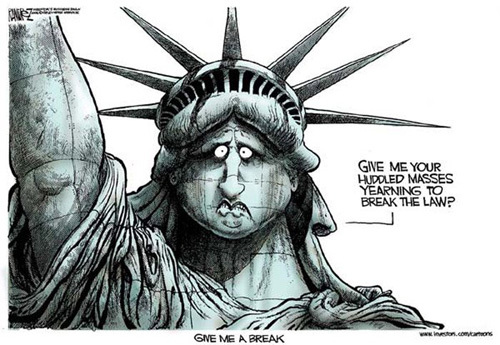 ILLEGALS! WE DON'T NEED NO STINKIN' ILLEGALS! With all this talk about electronic fences, smart fences, walls, National Guardsmen, Border Patrol and Minutemen being deploying along the border, PIG has come up with a most practical solution. It saves time, money and manpower and provides hours of ongoing entertainment. What is it, you ask? Why it's Landmine Lotto, and yes Chico, come on down. It also has the potential to be the ultimate reality show set along the U.S. / Mexico border. Caution: This is a show that you won't see on Telemundo or Univision. "Señor PIG, how do I play? ", asks our contestant, Chico. Very simple. It involves liberating all the world's land mines and using them to line our border. 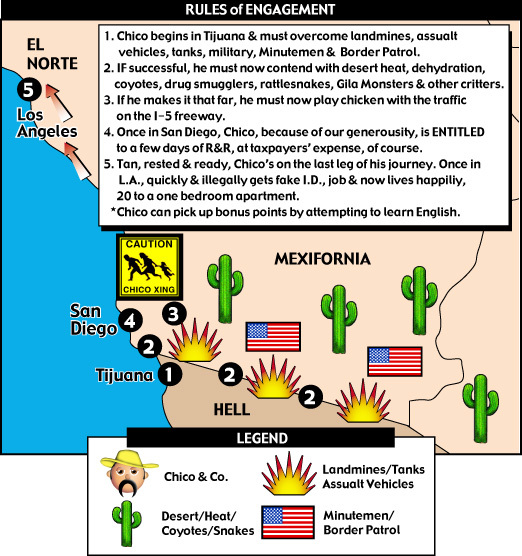 If a player - Alas Poor Chico, I knew him well - stumbles through the mine field without blowing his nuts to Hondouras, he must wait until Juan, Guadalupe, whomever blows themself up. At that point, he must replace the exploded mine with a new one. If he manages that, he's free to enter the USA. Or, if he refuses, he's tagged with an electronic transmitter, ala Wild Kingdom, and sent back. In addition to "Landmine Lotto", our contestants can play "Gauntlet" (trying their luck between two lines of heavily armed troops) "Tunnel Rat" (a tunnel system that's rendered exicting by adding a boatload of poisonous snakes and other goodies), "Human Cannonball" (The gun is very big, but the target is very small and surrounded by boulders plus steep cliffs), "Dodge them cars" (Something like crossing the San Diego Freeway, but the cars are bigger and traveling faster). Don't get us wrong. All kidding aside, we at PIG do not advocate making illegals dead, or even felons (HR4437). We DO want to make them disappear into their country of origin and get to the end of the line and go through the process LEGALLY, like almost everyone else.